In recent months I have been traveling to ASQ sections and divisions to meet with our members. Our members are very passionate about ASQ, and they don’t hesitate to bring up challenges that we must address as an organization. One of those challenges is our membership model. Simply put, members tell me that we must make it easier for quality professionals to be a part of ASQ. For some, the traditional section and/or division membership works great, but for others, it does not. While we will certainly analyze this issue, I think we’re not the only association in this boat. Most associations must generate new and creative ways to attract and retain members. This comes as no surprise. If you’re really interested, you could read this report from the Center for Association Leadership on changing demographic trends and how they affect associations. This isn’t just an American phenomenon. It appears that professional associations worldwide are also affected by demographic trends. Even without such trends, we intuitively know that there are many ways for people to get professional information these days—certainly on the internet and on social media, for a start. At ASQ headquarters we are sometimes asked for advice on best practices on attracting members to their section or division. I am by no means an expert on this topic, but I do want to share some tips developed by ASQ’s Community Development team, which works closely with our members and volunteer leaders. Asking people to attend an association event is an authentic, effective, and simple way to engage potential members. The Community Development team tells me that people of all ages are three times as likely to help if asked directly. In this age of electronic communication, do we ask people to help, face to face, as frequently as we could? In addition, current association members can refer members and colleagues. They can invite them to association meetings and events, and they can follow up with members who’ve lapsed. A simple call or email can do the trick. To encourage committed members to step up and become association leaders—such as volunteers or chapter officers– explain what’s in it for them. Think leadership experience, practice and application of skills, and personal achievement. You should be ready to provide enough information about specific requirements and expectations. Finally, of course, asking them is the most effective technique of all. Now let’s hear from you. If you’re part of a professional association, how do you encourage people to join or volunteer? How do local trends impact your association? *Not to trumpet ASQ, but in November we will resume our annual Adding New Voices campaign, in which ASQ members can give a free, six-month membership to a colleague or friend. Members, watch your email for details. The answers are always found in the QUALITY definition. Check my response on my blog and let me know what your think! What attracted me to ASQ in the first place were the certifications. Reasonably robust and recognized demonstrations that I really have skill sets my resume says I do. But after the second exam I thought it might be appropriate for me to check out the local section meeting of the group that setup and sponsored the test, and made it really convenient. What I found was a passionate group of folks that I could talk with. Hi James, You may be interested in a new certification we are working on “Quality aligned with Governance and Financial systems.” The chair is Jd Marchevko, JdMarhevko@Frontier.com. I have 2 questions for you. Are you attending the ISO 9001:2015 presentation at Fordham next Wednesday? If so, do you live in North Jersey? I need a ride to the presentation. Let me know. I wanted to be part of a professional learning organization, not just a group of folks that met for dinner and heard someone talk about something that made their mother and children proud. I wanted to belong to an organization that would provide me continuing education and learning, some leading edge tools and techniques on quality improvement, and certification opportunities along the way. Earlier this week in a quality management job interview, a senior director commented to the effect that “We have noticed that you have held some leadership positions in ASQ.” What a surprise! I shared that I had been a Section QMP/SMP/PAR Lead, Vice-Chair, Chair, then asked to be a Deputy Regional Director, and then appointed to the current position of Regional Director. To which he replied, “Excellent. We encourage professional development as well as certification.” I have since met their Vice President and am waiting for next steps. Thank you ASQ for providing the practical leadership and certification opportunities that are available to all that are seeking them, whether they knew about them or not. When I started preparing to appear for ASQ certification exam, I became more aware of ASQ. 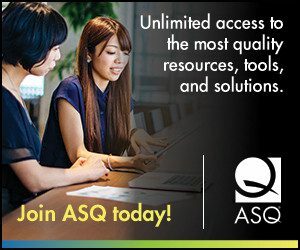 I took personal membership in ASQ, initially for getting access to the journals and get connected with fellow professionals for personal and professional development. But when I got benefited through journals, as they were more informative and in every month I could find few things or thoughts that I could take into my area of work. Today we live in the world of options and choices. Today we analyze what benefit I will get if I become a member or extend my membership. The choice gets influenced only through the purpose or benefit one is expecting. For example, at the initial stage, many take the membership because they see the benefit of getting discount while appearing for the exams. ASQ may look into providing credit points through sharing learnings when candidates retake or reappear for the exams which will keep the membership alive. Previous Previous post: Celebrate World Quality Month in November! Next Next post: How Does Quality Fit Into Social Responsibility?